Unfortunately, former shy and romantic indie darlings Hefner are no longer with us. Instead (and "unfortunately" is still in effect here) Darren Hayman and John Morrison have regrouped as The French. Local Information, their debut album, is the result of ending Hefner. Not believing a band should carry on too long, Hayman has written this album as a fresh start, though it isn't too far off of the last, disappointing Hefner offering, Dead Media. Focusing more on electronic outlets and simplicity as a duo, The French still showcase Hayman's unqiue vocal delivery and insightful lyrics. Most prominent is "The Wu-Tang Clan", a song about a girl infatuated with the notorious Staten Island hip-hop collective. There is plenty of humor and wit in the song, along with the entire album, but the instrumental elements -- the lack of guitar and the overabundance of nerdy synthesizers making loopy, sci-fi sounds -- don't quite fill the void. 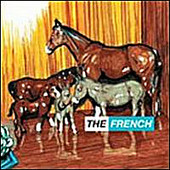 The French have a right to exist, but then again, the public has a right to miss the Hefner that produced three great indie records filled with some of the humblest pop moments in history. For a nice transition from guitar-based indie rock to electronic pop, try The Postal Service.